Ok, just one more movie rumor concerning Wolverine 3 and I'll be done with them... for now. The movie that is set to hit theaters early in 2017. If you saw X-Men Origins: Wolverine, then you know the God awful job they did of portraying Deadpool. But you also know that Liev Schreiber played the role of Victor Creed, also known as the Wolverine antagonist Sabretooth. Well, there have been whispers of him reprising his role in the latest installment of the movie franchise. We'll all have to see if this is going to happen or not, but it seems very plausible to me. Not much, or anything really, is known about the plot of the upcoming film so really, at this point, anything could happen. Sabretooth has a long been connected to Wolverine, but he started out in comics going up against Iron Fist. When we first meet the character, he and his hired team of mercenaries have taken Jeryn Hogarth prisoner. When Iron Fist and Colleen Wing arrive, a huge battle ensues. 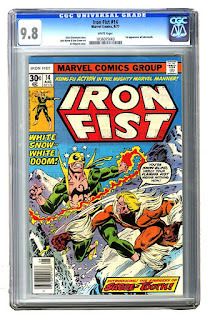 As the battle rages on, Iron Fist becomes blinded by the sun reflecting off the snow, and has to rely on his training and remaining senses to defeat Sabretooth. In the end, the two are victorious and rescue Hogarth. When Chris Claremont and John Byrne first created Sabretooth, the intention was that he would eventually become Wolverine's father. You can kind of tell, even in this issue, that was the way the wanted to go with the characters. The two even have a similar way of speaking, like their overuse of the word "Bub". As other writers took over the job, they got away from that and it was eventually proven that Sabretooth is not Logan's dad. To date, there are 2,913 copies of this Bronze age key issue in the CGC census. Most of the copies are a nice high grade too. 1,592 of them are graded between 9.0 to 9.8, with 135 being the highest grade 9.8. Obviously the rest are in mid to lower grade, but even those might cost you a little bit of your hard earned dough. According to GoCollect, the latest sales for 9.8 copies are dropping at around the $1,500 mark. That's up there, but it is the first appearance of one of the more popular Wolverine villains. Values for 9.6 copies drop off significantly and are selling for less than $600. If you're budget is in the $200 range, you can still pick up a respectable 8.0 copy. Or, if you're lucky, maybe an 8.5. If you're a fan of rare, short print comics, and you have deep enough pockets, then be on the lookout for the 35¢ variation of this comic. Marvel wanted to test the market to see how people would react to a price increase, so they printed a small number of issues do this. 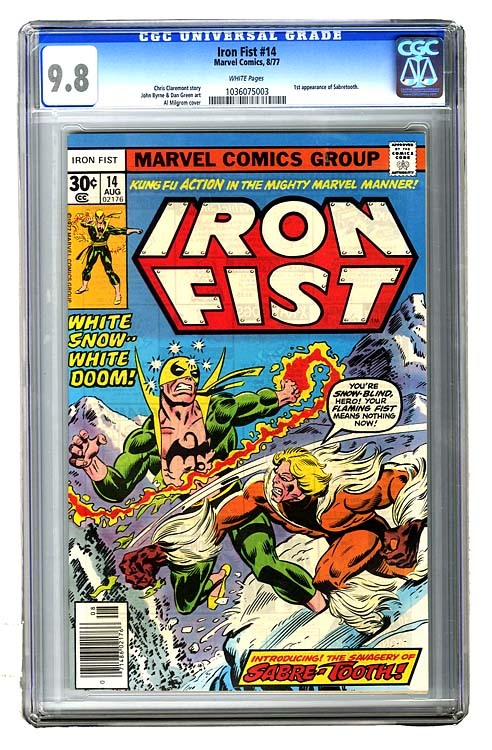 Iron Fist #14 was one of the comics. When I say rare, I mean rare. There are only 43 copies of this variant in the CGC census and the last sale on eBay for a 9.0 copy sold for $4,000 way back in 2014. Right now, there is an auction for a CBCS certified 8.5 that has an asking price of $8,900 with a best offer option. Whichever copy you decide on, this is a good investment comic. Sabretooth is a fan favorite character and there is always a fan base for him. Also, if you're deciding to sell a copy you already have, then keep an eye out on sales. You could see them jump up with the rumors of him showing up on the big screen soon.